It didn’t take long after Raspberry arrived at the Dumb Friends League Harmony Equine Center for the 10-year-old donkey to earn the reputation of being friendly. Sure, she could be a bit stubborn sometimes, not wanting to walk on the lead, preferring to simply relax in her pen, but she never failed to meander over to visit any human who seemed even the tiniest bit interested in giving her a pat, or even better, a snack. It was her affinity for snacks that caused the affectionate donkey to be a bit … well, stout. Staff at the Harmony Equine Center worked with her to help her lose weight and provided her with a hoof trim to help make walking easier and less painful. And, soon enough, after shedding a few pounds and getting that much need donkey pedicure this gorgeous gal attracted the attention of one lucky adopter. Tim and Lori were looking for a companion for their current herd of five horses and for their grandchildren to groom and love. And, living up to her reputation among staff and volunteers at Harmony, it didn’t take long for one special donkey to become the apple … or raspberry … of Lori’s eye. Lori’s experience with Harmony didn’t start with Raspberry. A long-time believer in adoption and having adopted many pups over her life, Lori knew that when it came to adding a companion animal to their pasture they wanted to adopt. A regular visitor at Harmony, Lori got to know the staff, and they got to know her, and it was one fateful Friday when Lori, on her way to work, felt compelled to call Harmony. Lori spoke with Hayley, equine coordinator, who mentioned Raspberry, sent a photo and encouraged her to come in for a visit. 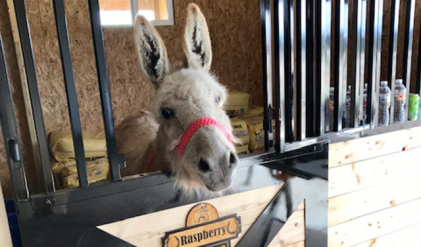 And, as they say–“it was love at first sight.” Lori walked up to Raspberry’s pen, called out to her and was greeted by the classic donkey “HEEEE-HAWWW” and a still slightly tubby donkey trotted over for a quick hello. Lori was smitten. Raspberry was it–no question. According to Lori, they have spent the “last several years waiting to find the perfect family member, and she is the perfect family member.” Raspberry has upheld her reputation of being the sweetest donkey ever and is enjoying life with Lori’s five horses and three grandchildren who all love the not-so-little donkey with everything they’ve got. In the wise words of our new friend Lori, “everyone should adopt,” and we could not agree more! The Dumb Friends League Harmony Equine Center is open to the public every Friday, Saturday and Sunday and by appointment Monday through Thursday. The dedicated staff will work with you on finding the right horse to meet your needs. All horses receive compassionate care, rehabilitation and professional training at the Harmony Equine Center. Change the life of an equine in need by visiting harmonyequinecenter.org today!